othercinemaDVD.com -- TV Sheriff "Not 4 $ale"
Emerging from the LA underground in year 2000, a self-proclaimed "video band" called TV Sheriff & The Trailbuddies hit the scene with their twisted take on performance art and VJ remixing. They have since taken their unique act to venues worldwide, providing animated commentary on the state of mind control in the USA. The Trailbuddies focus on the banality of television, creating rhythmic collages from appropriated clips of the most absurd broadcast moments. And besides their virtuoso sampling, the madcap ensemble creates original—and hilarious!—karaoke-style melodies on mass-media manipulation. Behind TV Sheriff & The Trailbuddies is the ingenious, Emmy-award-nominated Davy Force, an exceptional combination of brilliant director and hands-on computer artist. His recent projects include music videos for Devo, animated commercials for Bandai and the show open for Tim & Eric's Awesome Show Great Job. 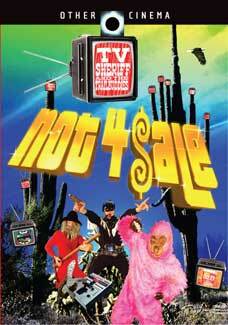 Not 4 $ale is the culmination of years of shredded/edited video-music compositions and live performances that lampoon as well as pay tribute to the world of TV commercials, game shows, televangelists, and network news. World of Evil—RE:volution Remix, a collaboration with smash UK DJ crew COLDCUT, nominated for Alternative Video of the Year and seen on MTV Europe. Gaucho Style, video-music remix recorded in LA. Vintage All-Star live video jam with DJ Q-BERT and VJ V2 at RESFEST 2000. Photo album of TV Sheriff in performance. Secret Menu with Secret Video...Shhhh! It's a secret! Official website for The Sheriff!